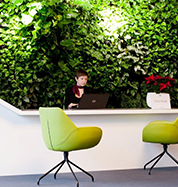 The walkway is a shared space offering exceptional atmosphere, green walls, pleasant music in the background and access to free Wi-Fi. 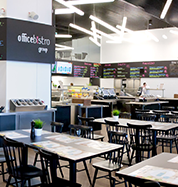 Have your lunch at one of the many restaurants and take advantage of a wide range of services and shops. You can also request the services of the professional Concierge & Lifestyle Manager, available to all Eurocentrum tenants asking for help in matters such as organizing business trips, family parties, collecting guests from the airport, booking tickets and tables in restaurants. Thenewsagent’s offers a wide range of press, tobacco products, telephone top-ups, books, sweets, toys and impulse buys. 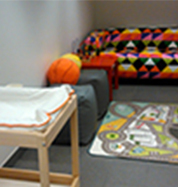 The Nail Clinic Salon offers a wide range of manicure, pedicure and SPA services. You will pleasantly relax in our pastel shabby chic interiors. Ecological dry cleaners and tailor EKO-TOP dry cleaners offers clothes repairs, mangle, fabric finishers, impregnation and water cleaning. A hairdressing studio with a team of excellent hairdressers, lots of enthusiasm, good energy and delicious coffee. Car Net is a car rental company offering short and long term car rentals with the possibility of return at different locations. Organization of business trips, family parties, assistance in collecting guests from the airport, booking tickets and tables in restaurants .... A professional Concierge & Lifestyle Manager, helping in both professional and private matters is available upon requests of tenants. A unique place created for architects and the most demanding individual clients. 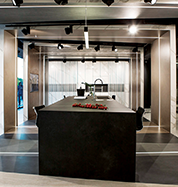 You will find a rich portfolio of natural stones from all over the world exhibited in a modern and elegant way. The showroom is a place to meet and be inspired, where you can admire the beauty of this noble material in comfortable conditions. 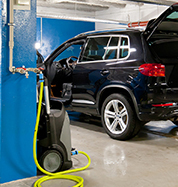 In the underground garage on level -3 in the core of the Gamma building our customers will find the Carsan car wash. The services include: body washing, interior cleaning and washing, waxing, varnish protection, leather cleaning and maintenance and ozone treatment. 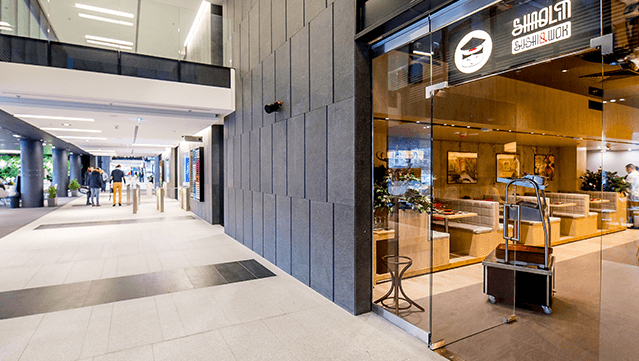 Żabka Delicatessen offers comfortable daily shopping for Eurocentrum tenants. You can choose among an extensive selection of fresh vegetables and fruits, bread, salads and ready made meals. 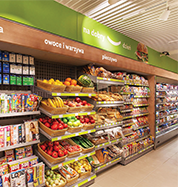 The shop also offers regional and traditional products from local suppliers. 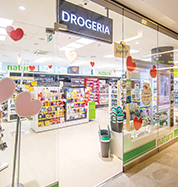 Drogeria offers a wide range of perfumes, make-up cosmetics, as well as skin, hair and nail care products. 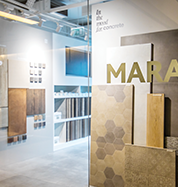 Marazzi designs and produces ceramic surfaces. Technology, high standards and reliability go hand in hand with style, passion for ceramics and beauty. 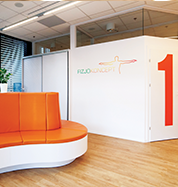 Laminam is more than just a showroom: it is a meeting place for architects and engineers, where intellectual and artistic paths cross. 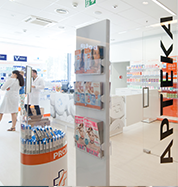 You can come and see full-size Laminam panels, which become the essence of the interior structure and exhibit the unique qualities of each collection. International cuisine, specials of the day every day, regular menu dishes and live cooking. We also offer tasty breakfasts, smoothies, freshly squeezed juices as well as cakes and desserts and special coffee blend roasted especially for us. 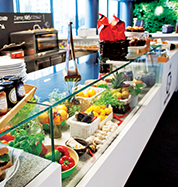 Restaurant provides catering services and food delivery to Eurocentrum offices. 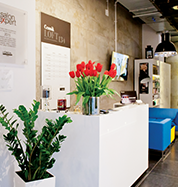 Daily coffee is a great place to meet and spend some leisure time in Eurocentrum. 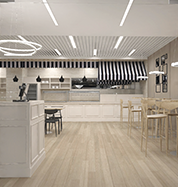 The smell of freshly ground coffee and croissants baked on site makes it a unique and pleasant place. You are welcome to try our delicious breakfasts, homemade cakes, Bio-preserves and jam. 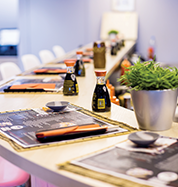 Shaolin Sushi & Wok offers delicious sushi made by professional Sushimasters. 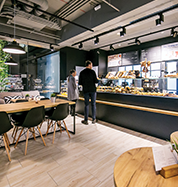 Gorąco Polecam Nowakowski offers sandwiches and salads prepared on site with own recipes, based on freshly baked bread and freshly ground delicious coffee. There are also offer high quality traditional bread and rolls for sale.